As the primary campaign enters its final hours, we examine the structure of voter preferences over the last year and half in the Republican gubernatorial primary. This is, of course, a view from 30,000 feet, but it does provide some perspective on a race that has upended many expectations. It’s worth pointing out that the trend lines here connect a disparate set of data points. The polls were taken at irregular intervals, so the straight lines in the early months — when we went weeks without any statewide polling — obscure variation and movement. Perhaps more to the point, they exercise a disproportionate effect on the overall trends. The clusters of polls in February are therefore a better representation of the basic structure of the race, and the general pattern is pretty clear: An election that initially favored Sen. Hutchison has settled into a contest where Sen. Hutchison’s support is in the high 20’s while Gov. Perry’s is in the mid-40’s. 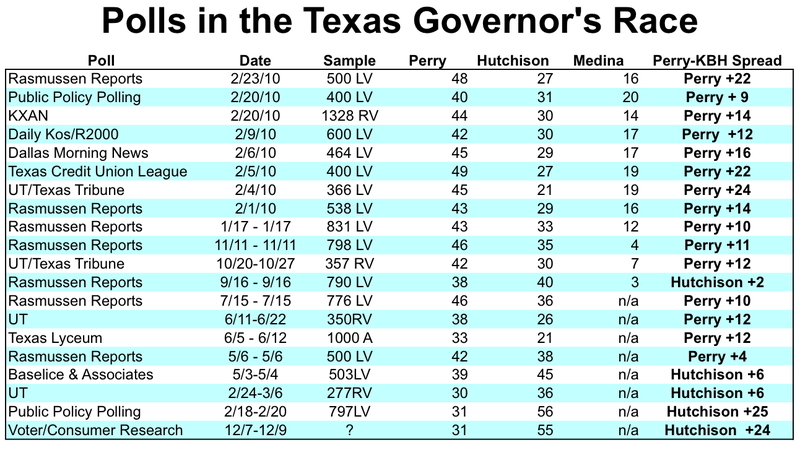 Hutchison’s advantage appears to have begun to erode early in 2009, and — with the exception of a September 2009 Rasmussen poll, which now appears to have been an outlier — Perry has led in all surveys since June of that year. We didn’t label the polls, so you’ll need to use the list below to identify your favorites (and the one or two data points you might consider partisan or campaign polls). Thanks to Adam Myers for gathering the data. This article originally appeared in The Texas Tribune at http://www.texastribune.org/2010/03/01/how-the-governors-race-polls-have-trended/.